I spent the afternoon turning Larry into steak and bits for casserole. All went well (as well as it can if you never cut up back legs before)and I have him in smaller bits waiting for final processing and freezing. One of the things that I will need to find if I do this semi regularly is a bigger chopping board than the one I had. It was just too small. So I was wondering what other people use to process deer. Does anybody use a block of macrocarpa, or is it just not suitable? bamboo one from briscoes. 10 years old and going strong. give it a wash in hot water and pour on some vinegar. I use the one in the photo below. My old man made it for me. Dressed pine planks. It's a great size, can do a fallow or hoggot sized animal pretty much whole. I wouldn't use macrocarpa, as (I'm guessing here mind you) it would likely leave a distinct "flavour" in your meat. Kahikatea would be best, used to be used for butter boxes as it imparts no flavour. Tommy, 40mm, dannyb and 1 others like this. 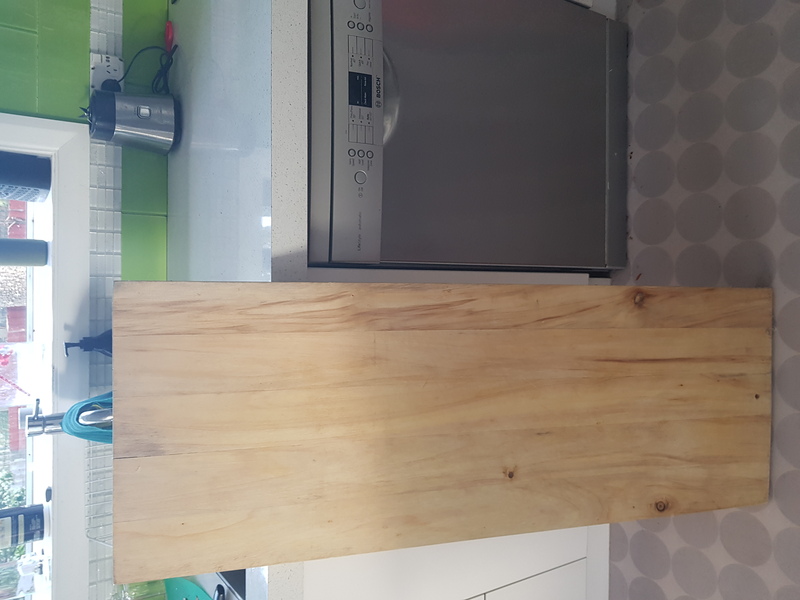 Ive got a couple of wattle ones my mate whipped out on his portable sawmill....they are about 10''x2'' and one 12'' long the other 18'' long.oil them up with cooking oil heaps and heaps to begin with and they last great...DONT use the meat cleaver on them. I got a butcher mate to process a deer for me twice over the years,just purely to watch how.... the knack/trick is to seperate each muscle off one at a time then trim off ALL the silver skin. I use the kitchen sink to hold the steak and a 20ltr bucket on floor for any "non steak" bits...most in the bucket go through mincer with a course blade as do the off cuts when the steak is done,keep a couple of bags for casserole. Yes, good point Micky Duck, oil them up to keep them good. I have another smaller but really thick one I use for sawing or chopping on. Usually untreated ply for the large cutting/boning. Then over to a big offcut of macrocarpa from a friends gigantic kitchen island. The "offcut" is still huge. Planed it flat and used butchers block oil. Never noticed any added "flavour" and that one has had 20+ animals over it. Trick is to keep well oiled with anything I think. Have heard/read somewhere that using cooking/vege oils can end up with them going rancid over time. Have never seen this myself but has anyone else? Moa Hunter and dannyb like this. Some years ago the fishing industry compared the sanitary qualities of wooden versus plastic boards, by taking bacteria swabs over a series of hours from boards. The best result came from using cedar / Cyprus timber boards. Timber from these families of trees have a resin that is anti-bacterial, plus timber wicks moisture away leaving the bacteria to dry out. Plastic boards have little cavities that trap moisture and bacteria. So long story short, use natural timber, Macrocarpa, Japanese Cedar, Douglas Fir, any timber with that strong cedar smell.